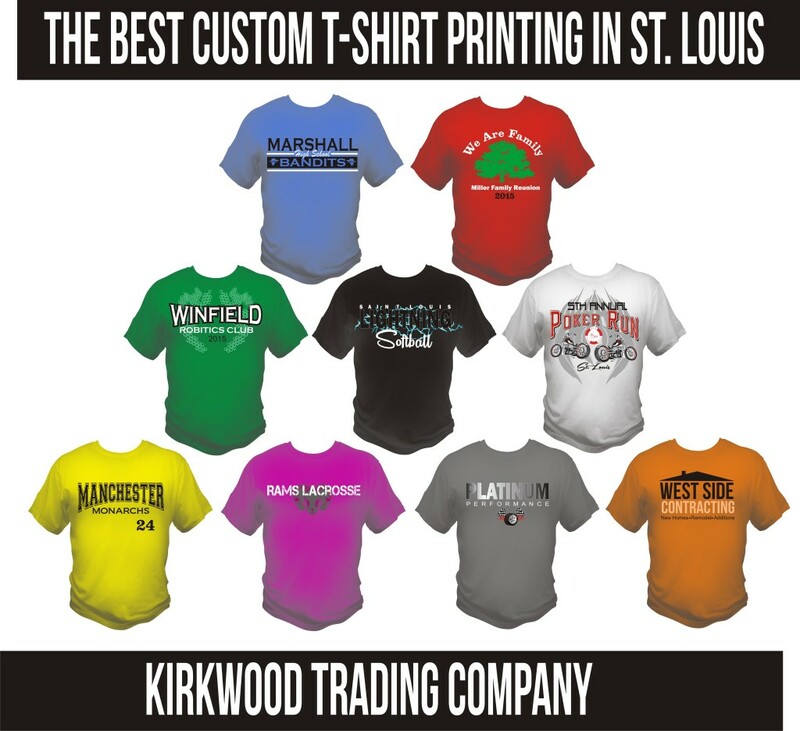 If you are looking for Saint Louis best custom t-shirt printing company you have found them in Kirkwood Trading Company. Providing quality custom t-shirts in Saint Louis for over 20 years they have relied heavily on their fantastic custom service and quality screen printing. When you visit their shop it’s apparent that they are busy with shirt samples hanging on the wall and the noise of the presses hard at work in the back shop area. They have several types of shirts on display hanging on their office walls showing various types of shirt styles, fabrics, and printing techniques. They are not unlike most t-shirt companies in that they don’t stock shirts or samples. Everything is custom ordered and then custom printed on site when it arrives from the manufacturers. Although they do have samples in various sizes on site of the most popular styles and also boast a nifty little shirt display that shows all of the colors available in various shirt styles and fabrics. How does a company get labeled as Saint Louis best custom t-shirt printing company? It would have to be longevity for one as any company printing custom t-shirts as long as these guys have has got to be doing something right. They interact with their clientele in a friendly old fashioned way that is comforting and assuring and more neighbor like that business to customer in demeanor. They take the time to explain options and pricing and if prompted will throw in their own ideas on design, quantity or style all for the purpose of saving the customer money and yet providing the most cost effective design possible in order to get the message of the shirt across. St. Louis best custom t-shirt printing company provides a lot of challenges on a daily basis. Kirkwood Trading Company serves a niche market because their capabilities allow them to print for a diverse clientele. They are able to do small order runs and really try to hold strong on their 12 shirt minimum order, but they can also handle custom t-shirt runs of a few thousand shirts as well. Most companies these days either specialize in large runs or small runs. Kirkwood Trading Company is geared toward serving any clients need no matter the quantity. When asked why they are Saint Louis best custom t-shirt printing company, once the modesty is put aside they believe it’s because while they are in this business to make money, they are always working with their customers to save them money. Providing all of their printing services on site under one roof cuts down on costs that one might find with a broker who simply is the middle man between a print shop and the customer. Kirkwood Trading Company is a direct screen printing operation meaning they deal with the customers and shirt manufacturers directly so there are no middle men which leaves a lot of room to save customers money. The next reason for their longevity and success they believe is a direct reflection of their print talent. Often times screen print shops can be a revolving door for screen printing employees. In the past 10 years Kirkwood Trading Company has had a a total of 5 screen printers with the current group of printers getting ready to celebrate their 3rd year as a screen printing Saint Louis best custom t-shirt printing company. When you get employees who share the same goal as the owners everybody wins. Another reason for their success is they pioneered the faster turn around times on orders. Even today most print shops turn orders around in two weeks or more. Kirkwood Trading Company has been turning most orders around in four to six business days. Where other companies are charging rush order fees for this short of a turn around time, this is the normal time when you order custom t-shirts from Kirkwood Trading Company. In my visit to area shops Kirkwood Trading Company stood out as among the best. A smaller shop by nature in terms of personnel, this has served them well with a more personal service to their customers which correlates directly with their custom retention rate as well as obtaining new clients. They can be contacted kirkwoodtradingcompany.com. They are happy to discuss any custom t-shirt needs you may have and in addition to t-shirts they also provide athletic uniforms, sweatshirts, shorts, hats, sweatpants, business wear, and much more. Tyler Abegg is a consumer interest blogger who travels the country visiting various businesses and industries who sell products or services.